Description Calculate volumetric curvature from a dip field to highlight structural discontinuities (e.g. from faults). This process computes the curvature for a volume based upon a dip field. 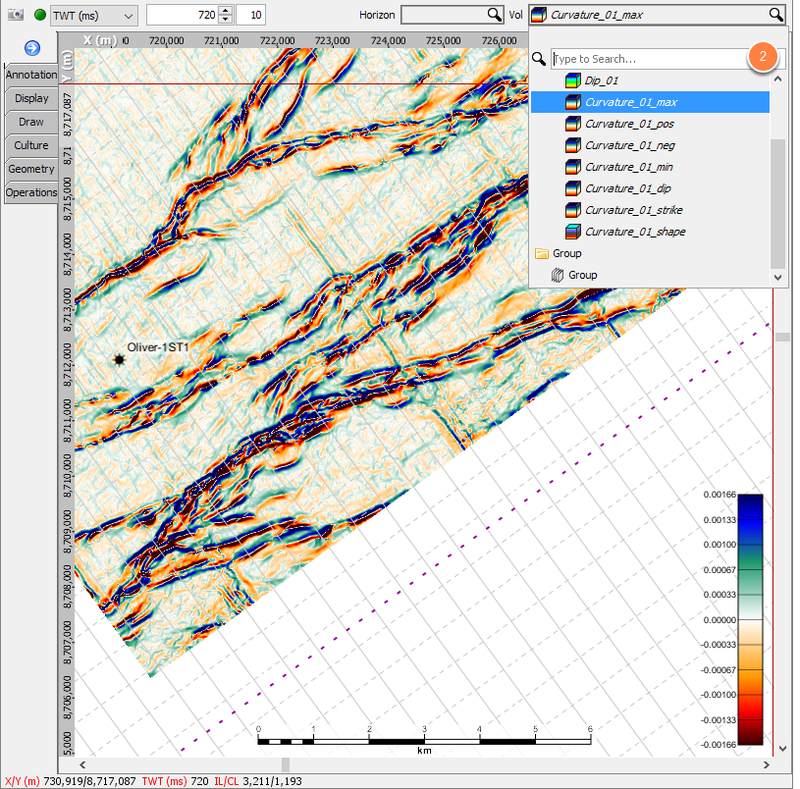 It can highlight subtle flexures and faults missed by other similarity based tools (incoherence, semblance, etc.). See Insight's Structural Curvature fundamentals for more details on curvature and how to apply it. Max Curvature: Calculate the highest magnitude curvature for each surface point. Min Curvature: Calculate the curvature perpendicular to the max curvature. Most Negative Curvature: Show the most negative curvature value for each point. Most Positive Curvature: Show the most positive curvature value for each point. 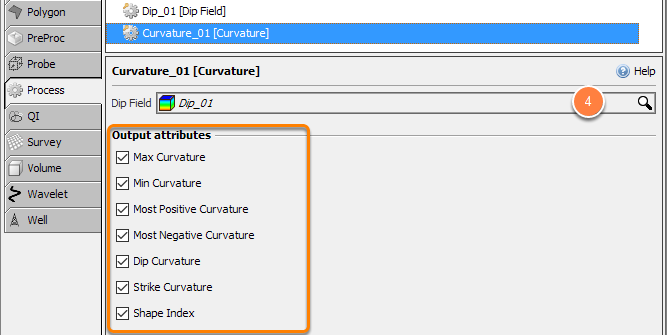 Dip Curvature: Calculate the curvature in the direction of maximum dip. Strike Curvature: Show the curvature perpendicular to the direction of maximum dip. To calculate the structural curvature for a horizon, use Horizon Properties and Structural Curvature for Horizons. The Curvature attributes are calculated from a dip field on a 3D volume. First create a Dip Field for your volume (see the Dip Field process for details). 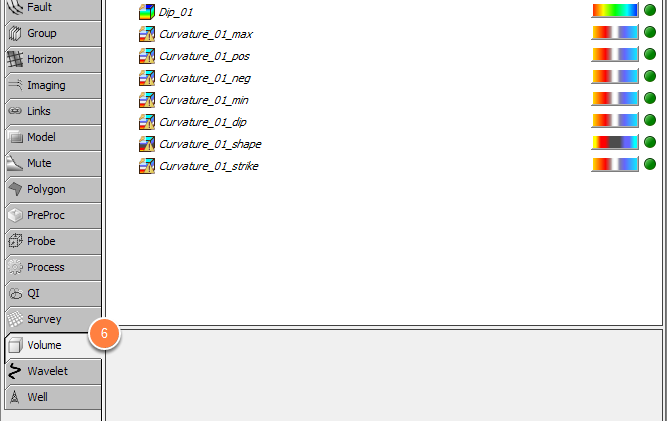 Add a new Curvature process via the Add button and select it. Choose the Dip Field to analyse. Note: Curvature cannot be calculated from a 2D dip field. In the Output attributes panel, select the curvature attribute you are interested in. Each selected attribute will create a new output volume in the Volume tab. Open Map View via Control Panel >> View >> New Map View. Select or search the Curvature attributes from the Volume selector. Note: Use shortcut keys F5 or F6 to adjust the colour temparature of the Curvature.